Our bamboo skewers are made in Thailand to the high standard that the street vendors require, so they won't burn up and/or sag when put to use. They are a nice and thick 3mm diameter. 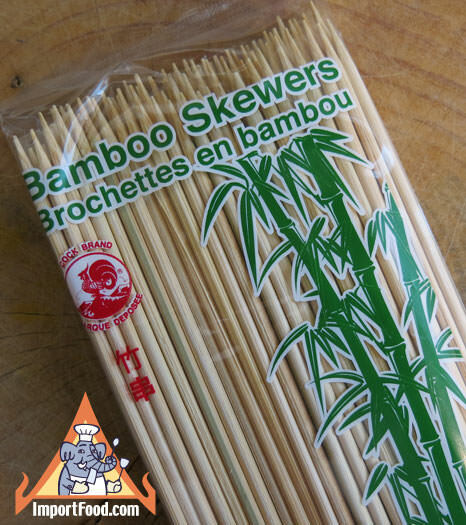 We love to make Pork Satay with these high quality bamboo skewers, 10" size is perfect for that. Also see them used in our recipe for Thai Sesame Chicken Kebabs. Use the skewers for all sorts of food preparation, and other things too. We discovered this recipe in the April/May 2013 issue of Fine Cooking Magazine, and it had an instant appeal. We love skewered Thai food, and this recipe calls for key ingredients that we import in the finest brands. We modified it slightly to make it less salty. Serve as an hors d'oeuvre, or as a main course for dinner. If using wooden skewers, soak them for at least 20 minutes before threading.